Thanks for checking out our above ground pool installation page. Here you’ll find our pool installation cost sheet as well as recommended Orlando area installation accessories. On the lower half of the page we have some information for anyone looking for self install information. This includes a list of tools needed and pool installation instructions for putting together pools without install manuals, these could be used a a guideline for used pools or new pools where the instructions are missing. The actual parts may be a little different in appearance but they all go together in a similar manner. If you have any questions or need help feel free to contact us. All of the above ground pools we install include the same procedure for proper installation and same attention to detail. We’ve installed pools for several decades and have a great system that ensures a very nice finished product. We guarantee our labor for 30 days, if you have an issue with the work we performed just call us us and we’ll return to fix the issue immediately. Below I’ve put together a guide as to basic steps we take to complete the pool. We supply the labor and all tools needed for installation. You supply the pool, accessories and water. Get a visual assessment of the pools install location and make sure it’s 10′ away from overhead power-lines and off property easements. Mark out pool location for excavation. Take a quick inventory of the pool package to ensure all parts are accounted for prior to work beginning. Excavate pool area and begin the installation of pool frame and level it. Install pool wall, pool floor pad, nutgrass killer, pool cove then the pool liner. We then pump in water to remove wrinkles from pool walls and floor. Install the filter system, salt system and other accessories. Hook up all plumbing and check for leaks. Take all pool related cartons and packaging materials to the curb for pick up. Pick up our tools make the area safe. We then give a the new pool owner a crash course in operating and maintaining their new swimming pool. Lastly, we cannot install or build pool ladders or steps ever. This is due to insurance regulations. Sorry. 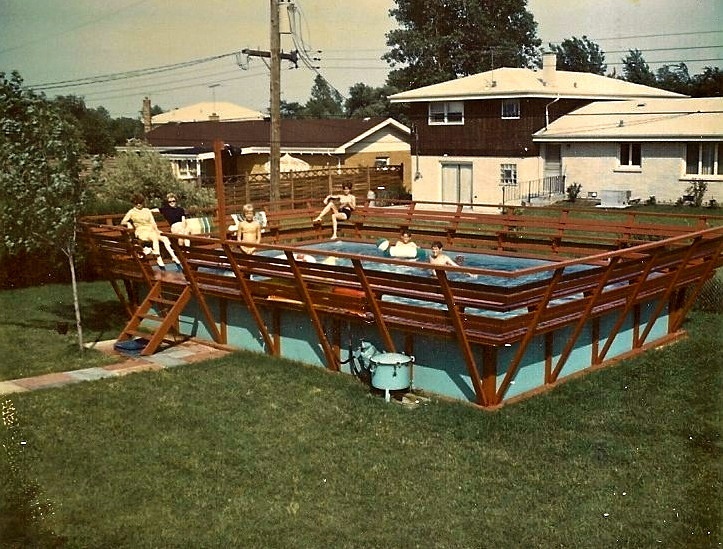 The typical amount of time required for the average size above ground pool is about 4 hours. Large pools and ovals may take all day. This is an important section to read before setting out to install your above ground pool, so getting the right accessories for your pool can save time, money and aggravation. To help point you in the right direction we have a list below of common pool or pool liner installation accessories. Some are lifesavers for anyone building an above ground pool in the Orlando area while other are just great upgrades. But in Florida moles and nutgrass are a real issue, so Armor Shield pool floor pad and nutgrass killer are always highly recommended. Having to buy a new pool liner in a month because of nutgrass or a mole is an very expensive lesson to learn! One last important thing to always do before ordering any pool products is to check pool size. This may sound silly but this one of the most common mistakes people make. Nothing is worse than finding out you have the wrong parts when you are in the middle of your installation. I’m not going to spend a lot of time on explaining the differences between various pool dealers and what they offer for pools and accessories. Instead I’ll make this easy by just telling you the best place to go for everything you’ll need. Log on to PoolsAboveGround.com to order you pool, liner or any accessories. They are an online pool store right here in Orlando and have been selling and installing above ground pools for several decades. They know what their talking about, sell only American brand pools and their pricing is great. They ship for free and can have a pool or liner delivered right to your doorstep in a few days, no fuss no muss. The price schedule below covers about 90% of the pool installations we do. This is for brand new flat bottom pools only. Prices may vary for pools with existing decks or yards in need of additional grading. Although the prices are similar, used pools usually cost a little more to install because they take longer to build. There are often missing pieces or parts that need reworking due to condition. This means parts are bent, damaged and require additional time. The pricing for used pools usually adds $50-$100 depending on pool size. If you are going to tackle the installation of your pool yourself, you are not alone. We believe that about 70% of all above ground pools installed are installed by the purchaser and not by a professional. And depending on your skill level, tool set, time schedule and willingness to conquer this beast, installing your own pool should take about a weekend. Less time for smaller pool sizes and maybe longer for large ovals and steep grades. If installing your own pool you’ll need some basic tools to get the job done. Below is a very basic list of items needed, some jobs may require more. Cordless Screwdriver – used to install the majority of pool hardware. Hammer, Pliers, Screw Drivers, Wrenches – assembly of pool And filter system. Tape Measure – verification of pool size. Spray Paint – used to mark out pool location and dig area.